Welcome to the Tuscan countryside! Our stone farmhouse sits on a hillside in Chianti, just 15 km from the center of Siena. We invite our guests to relax in the garden, take a walk on our 25 acres of private woods, and take in the view of the Chianti hills from the private pool. The house sleeps 10 people in 5 comfortable, spacious bedrooms with exposed wooden beam ceilings and terracotta floors. All the 5 bedrooms have AC. The pool is for your exclusive use. Villa Simo has 5 bedrooms, 3 bathrooms, 1 living room, 1 dining room and 1 fully equipped kitchen. You can make your own pizza and use the working wood burning oven next to the barbecue! Our property is perfect for families and groups of friends who want to spend a relaxing holiday immersed in a tranquil and peaceful environment. Open from April 27 to September 28 2019. The location is faultless and we had fun with many features of the property- the open fire in the living room, the outdoor pizza oven, the olive groves to wander around. It was April so the pool wasn’t quite open but we knew that before booking. Great bedrooms and a fab dining space. We were offered a banquet on the second night (additional cost) and after seeing the menus on offer decided to go with it... it was wonderful- great food and a lovely experience. We recently stayed here for a week's holiday. We loved the farmhouse. It had everything we needed for our family of 6. Simonetta was very easy to work with. She answered all of our questions quickly and was at the property to greet us and show us the home. She even cooked us an authentic Italian dinner the first night there. The food and hospitality was like we had never experienced!!!! We plan on visiting again!!!! Cannot say enough about this property. Simonetta was very responsive - both prior to traveling and during our stay. We stayed Oct 6-13, paid extra to keep the pool open (as many homes in Tuscany close their pools by this time of year) and would highly recommend to anyone thinking about this to do it - the pool area is fabulous and the views are exactly as Simonetta has posted. The home had everything we needed for a week in Tuscany - kitchen utensils, coffeemaker, etc. The rooms have wonderful views of the rolling vineyards and are very spacious. Bathrooms were fully equipped with towels, hairdryer and were very clean. We did not use the wood fire cooking area other than to sit out and drink wine at night, but it is a nice area to sit as once the sun goes behind the hills (around 5PM this time of year) the front side of the house still has sun and is nice and warm. The nearest winery is Toliani. It is walking distance and the people are wonderful. This home requires a car. Restaurants are anywhere from 5-15km away depending on what folks like. We found plenty of restaurants within this area and driving was not that bad - as advertised Italians drive crazy - but it is all a part of the experience!! Note- with regards to dining - as a midwest american we tend to eat dinner around 6PM - all restaurants in this area close from 3-7PM and they resume dinner at 7 - purely something to think about when planning your days. We rented a car in Rome and drove about 2 hours up to this home. From this home Firenze was about 80min drive, Pisa about 2 hours. All in all and amazing vacation at a fabulous villa in Tuscany!! Thank you Simonetta for sharing your beautiful place - I hope we can return someday!! Hi Carolyn, thank you for taking the time to write such detailed comments about our house and your stay. We appreciate your review very much! We were very happy to have you. Excellent with one or two small updates / repairs required to property. Authentic and comfortable rustic farmhouse. 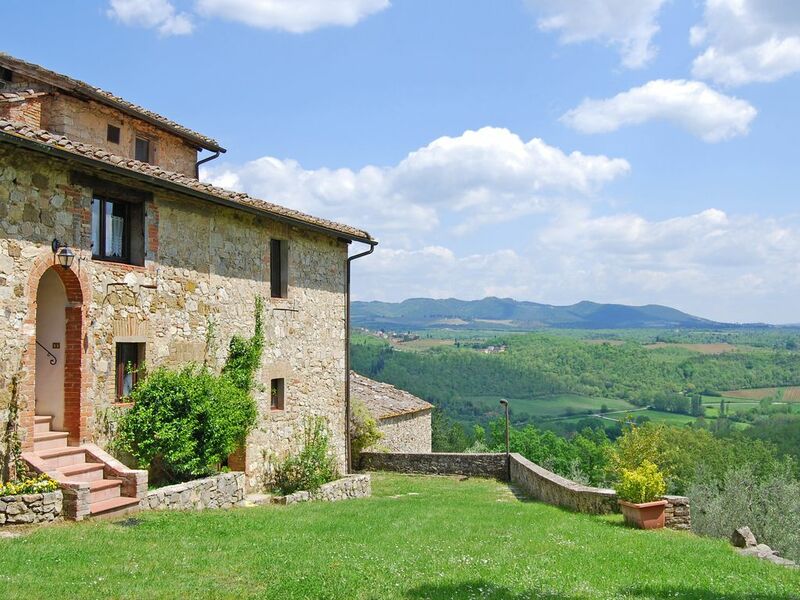 Beautifully positioned and well located for Siena and the Chianti region. Swimming pool has wonderful views but is not heated so a little chilly for some, even in August. Tolaini Winery and Castillo di Brolio were absolute highlights. Advise plenty of bug spray for sunset barbecues. A lovely holiday - thank you Christiano and Simonetta. Myself and my family loved the week long stay we had at Simonetta's villa. The setting is glorious, and the views were incredible. The house is roomy, and each room is very generous in size so no-one felt too cramped. The kitchen was great with all the facilities we could need, (just check the cupboards before you go shopping, as there was a lot of olive oil and vinegars etc available to use). The pool was glorious, and there were an assortment of sunny corners to sit in around the property as well. We all really enjoyed attempting to make pizza in the pizza oven (if it goes wrong there is a great pizzeria in the next village along). We loved the remoteness of this property - but be warned you will need a car to stay here, and the nearest supermarket is a good 25 minute drive. We loved getting to all the hilltop medieval towns which were all easily driveable. We also enjoyed the 20 min walk to the local vineyard (Tolaini) where we did a great tasting. Overall a fantastic stay - which was very much complimented by Simonetta's amazing chocolate torte that she left for us as a welcome gift. Thank you for your comments, we look forward to having you here again. The house sits at the end of a private road that runs 350 meters to the center of the property. The private pool is 12 x 4 meters, with a splendid view of the countryside. We invite you to immerse yourself in the absolute tranquillity of the Tuscan countryside. Outside, the large patio offers tables and chairs for dining al fresco, overlooking the hills. If you enjoy cooking outside, try barbecuing at the outside grill or making a pizza in the garden’s wood-burning oven. Inside, the dining room table comfortably seats all 10 guests, so that you can enjoy your meals all together. The full kitchen is well-equipped, and the living room boasts a large, original fireplace. A refundable safety deposit of € 200,00 is due upon arrival. At the end of your stay, your deposit will be returned to you, barring any property damage. Gas is not included and must be paid upon check-out (€ 5.60 per m3). Electricity is also not included and must be paid upon check-out (€ 0.40 per kw). Cleaning fee: € 100, to be paid at the end of your stay.